After spending the first half of this year in a fitness craze, I went in reverse for the second half. Although the summer was filled with fun activities like kayaking, hiking, skiing and biking, since the turn of chillier weather I’ve gone all out on the two activities I’m best at- eating and drinking. And what am I left with? Feeling like crap, and a limited wardrobe… once again. So I signed up for a new yoga website I found. One of the reasons I actually went for it is because it offers Anusara yoga, the style that I’m most familiar with and really enjoy. After only doing one class I’m certain it’s $18 a month better spent than $30 for the Y (sorry to my friend Sue!) Digging around the site yesterday I found the 30:30 challenge that they did back in October. The concept is basic- yoga everyday for 30 days straight. They even provide a list of classes from the website to do for the 30 days, so if you want to plow through with no thought required, you can. This is not to say that I’ll be skipping out on my local eating challenge. I’m still working towards doing that in February. So I’ll say it- as much as I love you, Weggies, you’ve let me down on this one. Maybe you’ll get it fixed by the time I get to my eating local challenge? 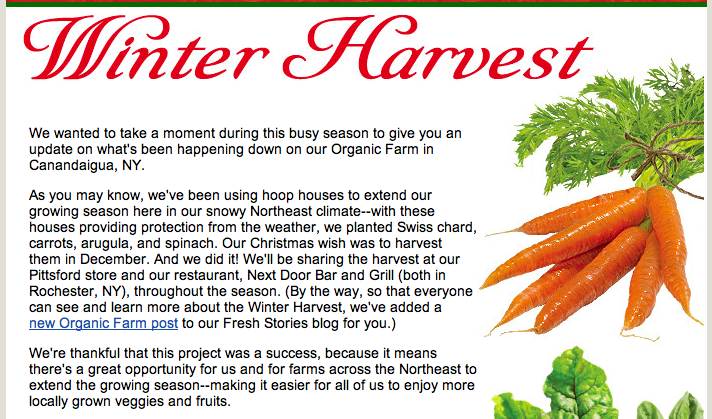 We came across your blog and we are very sorry that we let you down. The “Winter Harvest” we recently emailed you about was a test this year and there were very limited quantities- unfortunately, not enough to support both stores and the restaurant. We are planning on taking what we’ve learned this year and expand the harvest for next winter to have enough to supply Canandaigua, Pittsford and ideally some of our other Rochester stores as well. We realize our customers like you would like to have a better selection of local organics in all our stores. The reason the supply is low is due to the challenging climate in the Northeast. Many of our small growers we partner with can’t afford the risk to grow organically. Because we have little access to fresh organic fruits and vegetables locally, we wanted to start our own farm to gain an understanding of how to grow successfully in upstate New York. We only grow on about 3 acres of land in Canandaigua and that only produces enough for two of our stores (Canandaigua and Pittsford). Our mission is not to supply our stores with fresh organic produce from our farm but to teach our 540 small local farms how to grow organically in this area. By the end of 2011, we will have gained enough knowledge on how to grow organic produce successfully to share with growers who deliver to area stores. Then our small local farms may have confidence in growing fresh organic produce for you. As the season ramps up there will certainly be more produce from our farm at the Canandaigua store (hopefully in time for your eating local challenge). Thank you for your loyalty and staying connected with us through our emails. We really appreciate feedback like yours. Ooooh Anusara! I’ve been told to check this out b/c I’m an Iyengar diehard (any other style makes my bursitis flare up) and this is supposedly similar. Wegmans, WOW. Thanks. A proper response is too much for a comment… this will require a post of it’s own. How exciting. 52 Faces, yes, try Anusara! It’s a “close relative” to Iyengar in the yoga family, and I think that you get more out of any style the more styles you try. Nice to meet you through BlogHer as well.